All of the above may be true and you probably had a point in your life when you skipped a series’ OP every single episode. But be honest, sometimes appear franchises with openings so captivating and awe-inspiring that just makes you glad someone paid a bit of attention to them. It just gives that “eh, that was quite cool” feeling. They may not be the OPs of a masterpiece, they sure aren’t the greatest story ever told, but they definitely add some extra flavor to the series. After watching a bunch of Japanese cartoons with bland copypasted OP sequences, stumbling upon a series with a QUALITY opening is a refreshing break. Storyboard, key animation, music and the guy who chooses the color scheme whose profession name I do not know. Storyboard, first of all, is a graphic representation of how your video will unfold, shot by shot. It’s made up of a number of squares with illustrations or pictures representing each shot, with notes about what’s going on in the scene and what’s being said in the script during that shot. Think of it as sort of a comic book version of your script. An anime opening with an actual storyboard will be able to tell a short story instead of just making characters run in a retarded direction and jump in the air or stare at the horizon. This small story can be a sort of recap of what happened previously in the series (i.e. OP 2 of 24eps anime), a hint to future developments or even a sort of “day in life” from the main cast through short key scenes. It goes beyond scraping together a bunch of scenes and throwing some music with it, something very commonly done by action series. 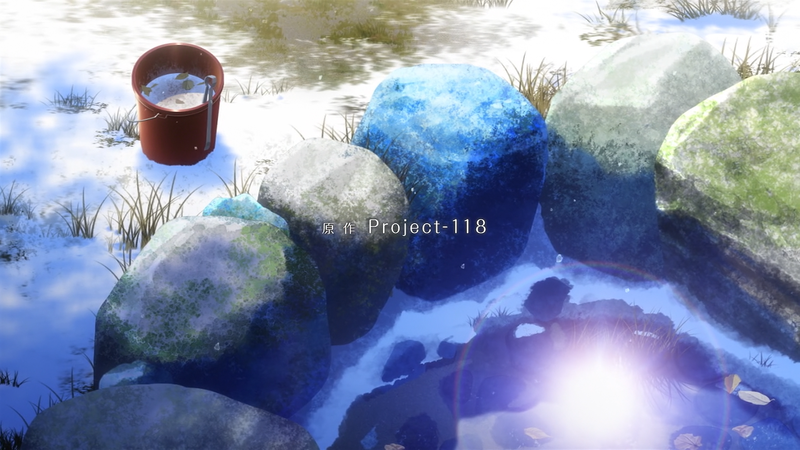 Notable example: what Makoto Shinkai did for minori’s ef: the latter tale goes way beyond your average VN opening. The music harmony, the manner characters are introduced without the need of any text, the sudden and smooth shifts of locations. It’s almost a film trailer. With that said, Key Animation is a fancy name for “deciding which still frame will begin a scene and what on it must be the focus of the next frames”. The person on this job (sometimes also the Animation Director) is often an experienced animator that, after receiving the storyboard, will work on cinematic and angles under director supervision. When speaking about openings, this is the guy who can make it memorable or totally screw things up. You know when characters are shown walking awkwardly with stiff arms and staring at the sky? When the music is not in sync with scene transitions or when said transitions are too fast and frequent for your brain to catch up? It’s this guy who fucked up. A good key animator will know which angle is best for which scene, what object should be the focus of a pan or when to make a transition between soundtrack pauses. Notable example: Masayoshi Tanaka is one of those staff members people rarely know about, usually because we usually only care about writers and directors. Well, this guy is not only behind many beloved character designs but also worked on the key animation of AnoHana, HSOD, Demi-chan, Magi, My-HiME openings and all of Toradora’s OP/EDs. If you still don’t know any of these, he also did the key animation of Kimi no NaWa opening sequence. Music is self-explanatory but there’s more to it than it seems. Behind a title theme there’s usually: theme song arrangement, lyrics and performance. These may or may not be done by the same person and finding harmony between them is also an art. The OP music must fundamentally feel related to the franchise, be it on lyrics that tell a bit of the story, instrumental that fits the setting or a rhythm/tempo adequate for the mood of the narrative. You’d expect this to be common sense, as one wouldn’t ask nano-RIPE to sing an opening for Berserk, but there are really messy title songs out there. Especially when it comes to finding the correct mood. A well known example of this is Clannad’s second ending theme “Torch”. It’s a great song and Lia’s voice is as beautiful as ever however the upbeat melody is the worst possible choice for an ED theme that plays right after some of the most emotionally-packed scenes of the franchise. The use of a foreign language is also very hit ‘n miss and usually show the commitment of the staff to coming up with an actual foreign song instead of just a bunch of Mondegreen. There are times when it fails horribly (Spice & Wolf’s Ringo Biyori), times when it exceed expectations (Patema Inverted’s Esperanto theme) and ironically, there are even times when it isn’t supposed to be good but ends up sounding pretty neat (I feel your love. Reflection! or I HAVE A BIG GUN, I TOOK IT FROM MY LORD from GUNDAM Wing and Black Lagoon respectively). Notable example: perhaps one of the most successful and popular Japanese singers of all time, Ayumi Hamasaki won her first Japan Record Award with “Dearest”, the third ending theme for InuYasha composed in collaboration with Do As Infinity. Not only it’s a wonderful J-pop song but it matched so well the animation and mood of that ED that it still evokes a overwhelming feeling of nostalgia in many of us these days. By the way, fun thing. 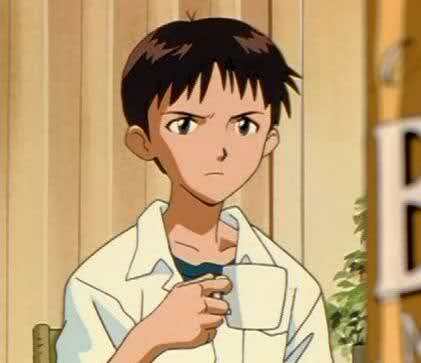 Inuyasha’s endings are all ridiculously good while the openings terribly forgettable. Finally, when speaking of the “mood” of a series, the color palette is a HUGE variable of it. Storyboards usually come on monochrome, so unless your director is really experienced (or really arrogant), there’s a guy there who will give his thoughts on the coloring (now I’m told this is apparently called Color Design). This doesn’t seem too important at glance but there’s a significant difference between a sad/depressing scene with vibrant, radiant colors and one with a dull/opaque cold color scheme. “Oh but my scene happens on a shinny beach” well then make shadows and ask your animation director to make scenes focusing on character expressions or the sea. Or just make it rain! Nothing more depressing than a sunny beach day ruined by gloomy rain. 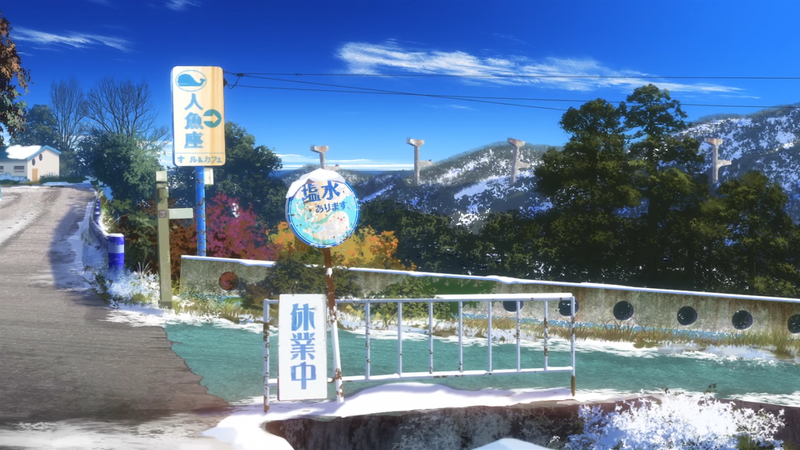 Notable example: Non Non Biyori’s OP is a good one. It’s filled with vivid colors and every scene has a warm palette. There’s a certain glow to it. It’s set in summer/spring so all the flowers are blossoming, the grass is pure green and the sun shines up in the sky. As you can see, it all works together. To further my discussion on the topic, I’ll make use of an example. Of course there ought to be many other openings out there better than this one but for me, at this moment, this is the best I’ve ever seen. 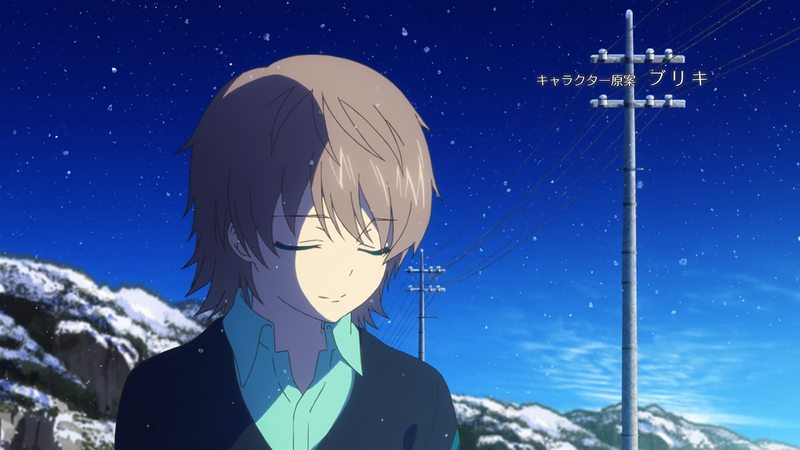 WARNING: Nagi no Asukara spoilers bellow. Skip this section if you haven’t watched the show. 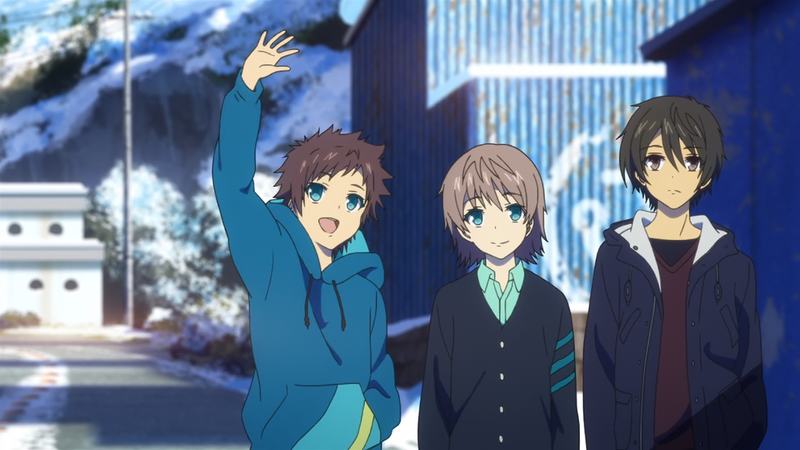 Case study: Nagi no Asukara’s OP2 – ebb and flow. Nagi no Asukara’s narrative structure is the same of most drama-romance anime with the school/teen setting. First half is reserved to introduce characters, tell some backstory and setup for a conflict that takes spotlight on the second half climaxing in either a romantic or tragic resolution. Being it a Mari Okada script, love polygons and teen angst were to be expected. How perfectly the opening manages to transmit this feeling of “change” is what impresses me. Right off the bat, one can already notice things are different this time. The first opening had a upbeat pop melody and a bright palette, there were lens flare everywhere and shinny reflections of sunlight in the scenario. The setting was underwater. This one, on the other hand, starts panning through snowy locations accompanied by a solo piano melody. Set on the surface. Credits start rolling with the planning committee’s tag. In the background we see the tiny “pool” surface students built for the sea-folk when they were children, it’s now mossy and abandoned implying a lot of time passed without anyone using it. Title card is revealed. 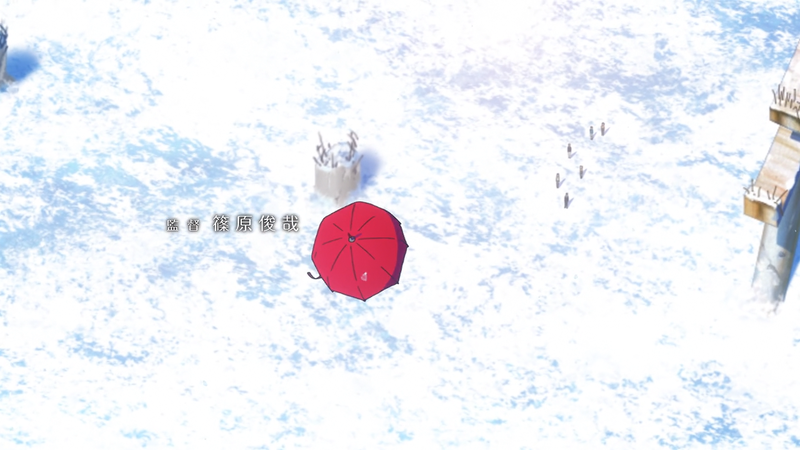 It’s snowing, characters are all gloomy, clothing is all in neutral tones, there’s a single warm color in the entire frame and it’s Miuna’s umbrella. This can be interpreted in different ways but it’s easy to assume things are in a bad mood and that umbrella may be symbolism for a link that can restore the vibrant, colorful tones of the first cour. 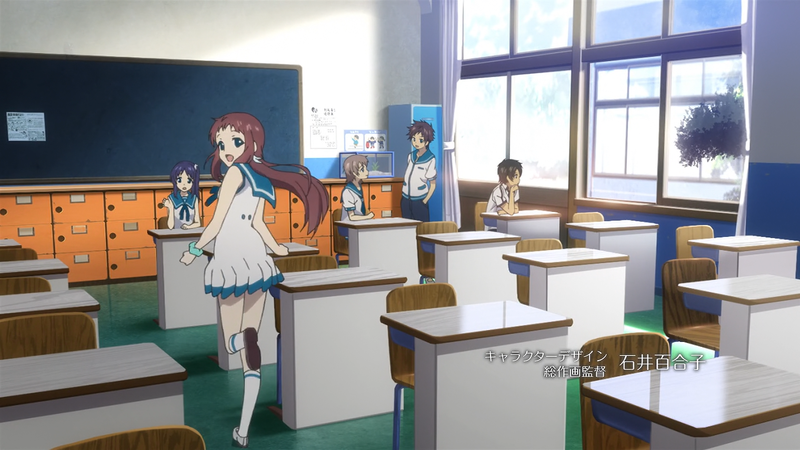 Later in the series it becomes clear said link is obviously Manaka, the only main character not present in the shot. It zooms on characters and all have distressed expressions. The lyrics read “Little snowflakes dance in the air, I’d almost given up on my dream, but it washes in again like it did so long ago” implying relationships require closure and things can’t stay that way. A transition is needed to change from the title card environment to the continuity of the opening. 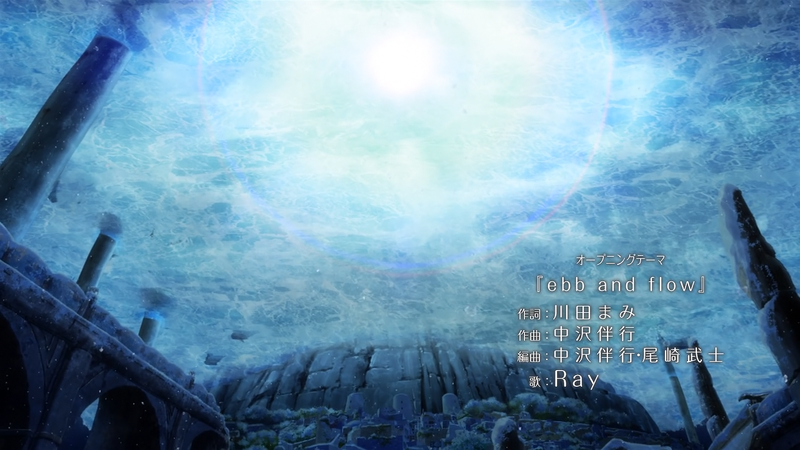 Usually anime series do this by simply fading to black, through a white flash or via Gaussian blur. 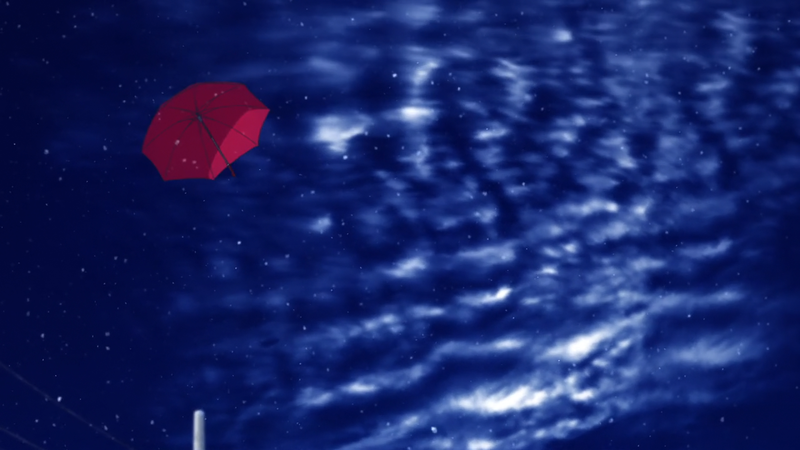 Here the umbrella flies away, which also holds symbolism as the next character to appear is Manaka herself. Music follows accordingly, more tones start to play at the background. A sudden frame change between the past and present, here is the perfect example of how colors and lighting can transmit feelings. 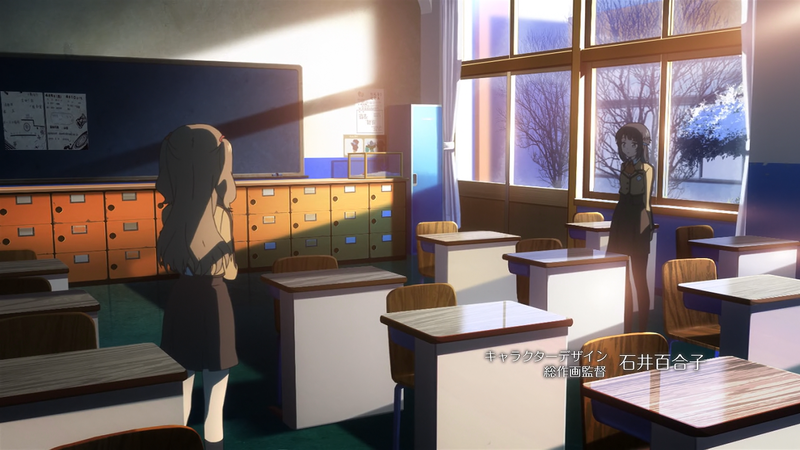 From a noon shot to a evening scene, the exact same place goes from an once energetic scenery to a poorly lit and depressing empty classroom. 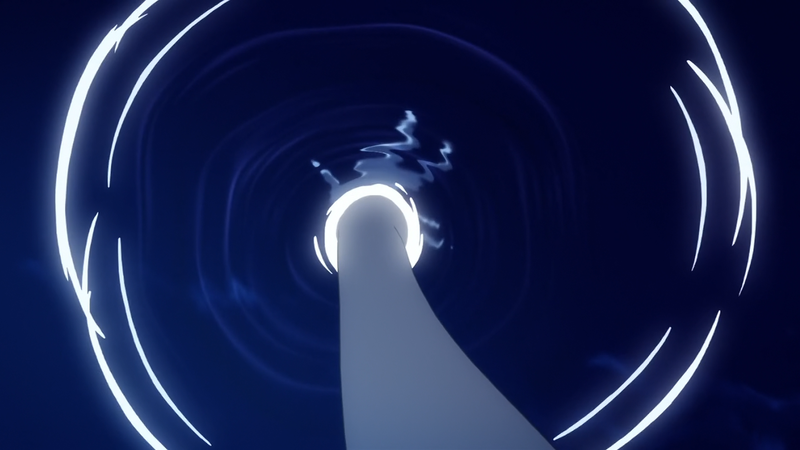 Hikari’s stretched arm reaching for the blue skies actually touches water. 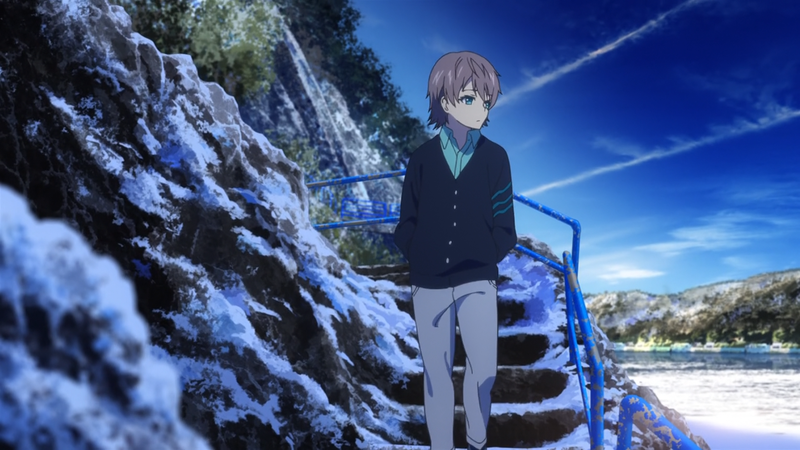 Song’s vocals resume and lyrics read “doushite?” (“why?”) briefly before the scene changes to a now-frozen sea village, consequence of the events set in motion during anime’s first half. Music drops in perfect synchronism, now with drums accompanying. This is where most series screw things up because they usually take advantage of the drop to introduce some “epic” action sequence and speed up the animation even though the music’s tempo didn’t change. Nagi fortunately doesn’t do that and resume to showing characters in familiar locations of the story. The main cast reunites, boys and girls from different paths. 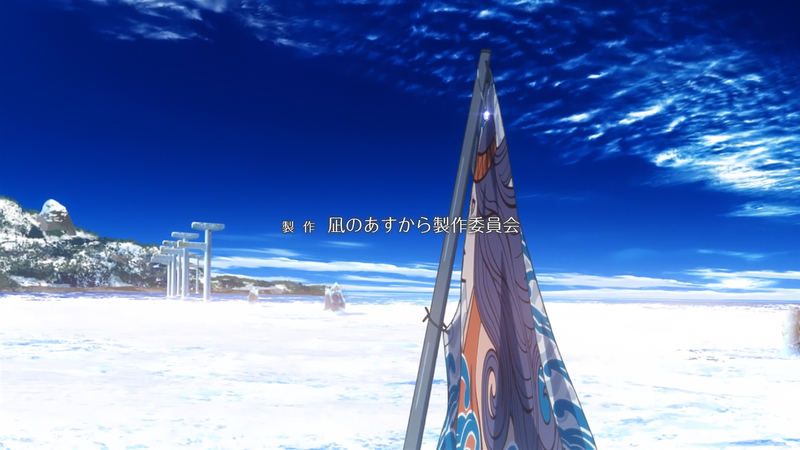 As they walk through the frozen ocean we see Miuna’s umbrella that flew away, a hand grabs it and the opening finally concludes with a shot of the ceremonial flag. 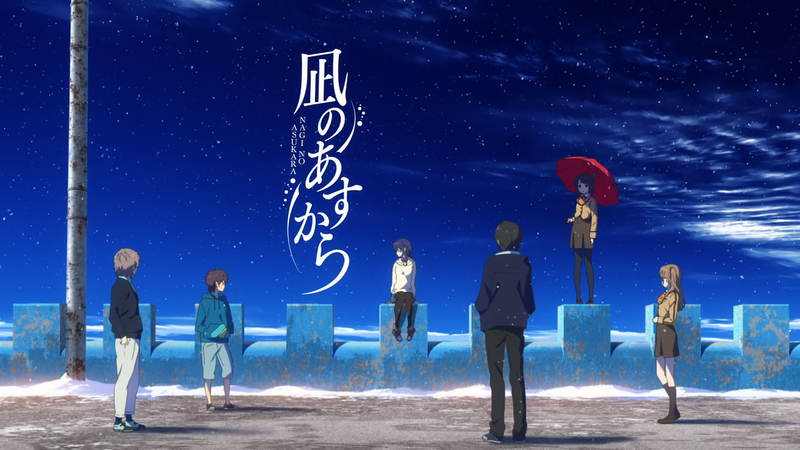 Here the connection that was hinted on the title card becomes obvious, the umbrella symbolizes restoring brighter days and the missing link to this group. 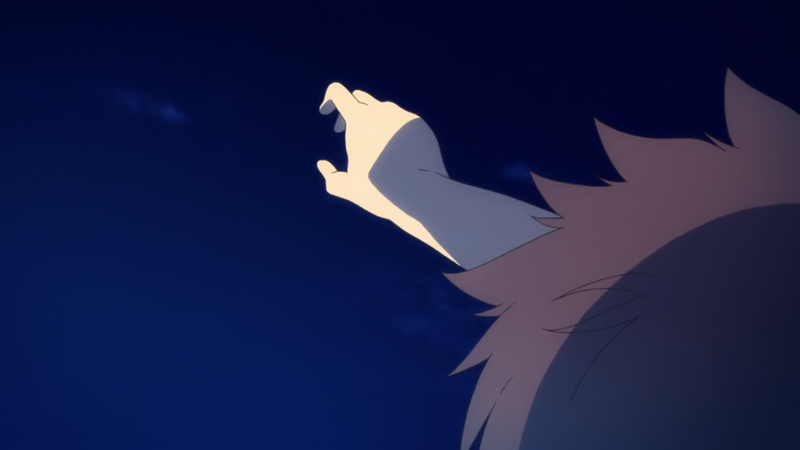 The hands that grabs it are Manaka’s but she is not shown yet since she’s still missing somewhere in the ocean. Later on, after the episode when they “find” her, this final scene changes and shows her picking up the umbrella and looking at the cast. All that in less than 2 minutes. How did this turn out so good? Is P.A.Works the almighty God of openings? Of course not. They are just really good with color design. Just like KyoAni is good with cinematography, old GAINAX was with music and Madhouse with transitions and fast paced sequences. The only reason this turned out to be such a great opening was because all members of the production staff were committed to it and all of the elements described on the beginning of this post were present. To wrap up, once you start paying attention to these things, you start noticing some trends. A lot of low budget franchises just go with a “let’s get over with it” OP and throw the usual tropes into a huge salad of j-pop and characters running, birds flying, characters turning their heads, cherry blossoms and tears, lots of tears. There are also some “we wanted to do something nice but didn’t have the budget nor time” such as Sora no Woto and Gunslinger Girl which have great music and the mood really fits the franchise but animation is lacking or uninteresting. Finally, sometimes you find OPs/EDs that truly excel and are later easily recognized by those who watched it through simple screenshots or lyrics. All of Aria’s openings, Clannad’s Dango , S&W Tabi no Tochuu, ef: Melodies, KareKano, Kannagi, Toradora’s Silky Heart, Nichijou, Carnival Phantasm’s KIMI TO, Bokurano’s Uninstall, DATABASE, JIBUN WOO, Hare Hare Yukai, and even though it’s a KEY opening, Angel Beats! is so phenomenal it’s literally one huge spoiler without people even realizing it. And likely the best English insert song to this date, Akino’s Genesis of Aquarion. ← Kimi no Na Wa – Shinkai back on top of his game. Kind of.